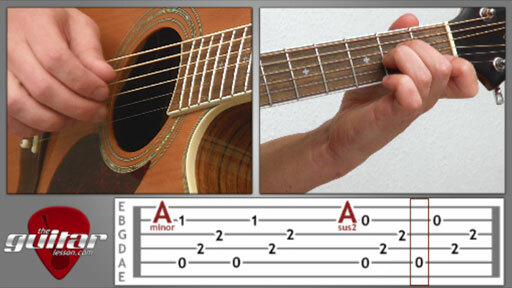 The song is played in the key of C, and revolves primarily around the C major, A minor, and a couple of other chords in the key of C.
You'll be doing lots and lots of fingerpicking with this one, as well as learning a neat strumming pattern, which will come in handy while learning to change between the chords of the song, and also if you are playing along with other guitarists. It's great fun to have 1 guitarist do the fingerpicking part, and another one strum along with the chords, try it when you get a chance! And of course, if you are the singing type, you'll be able to sing along while playing the chords. Now the chords to Dust in the Wind are simple, but memorizing the exact chord progression will take a bit of time, so make sure you download the tabs file from the lesson page as well. This was actually one of the first songs I learned when I decided I want to do more fingerstyle guitar, and I haven't regreted a moment of it. I actually play this song even today, 10 years after first learning it, and I can promise that you will too. This is really one of those rare songs that you never get bored of. Dust in the Wind was a true pleasure teaching, have fun with it!